(2003-03-01) Donated by the Family of Martin Edwin Trapp, Jr. Manufactured between 1934 and 1939, the Deagan 50 Series “Masterpiece” marimbas were designed not only for tonal excellence, but also to be both portable and sturdy enough to tolerate rough use by a traveling percussionist. 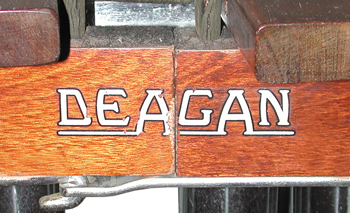 This instrument was the last of a long line of Deagan instruments that used a tube frame design originally known as their “De Luxe Wheel RackA metal assembly that surrounds the drum set and holds the top parts of cymbal stands as well a...” manufactured from tubing and featuring large caster wheels. The instrument was favored both by public school programs in search of durable, portable instruments of quality and by professional performers for the stage, radio, and dance bands and orchestras. 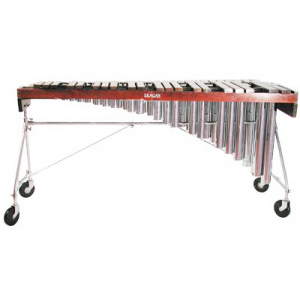 The supporting rails and chromium-plated resonatorsThe metal pipes that extend below the bars on a marimba, xylophone, or vibraphone. They carry t... each split into two pieces, allowing the entire instrument to be packed into either one trunk for shipping or into three cases for easy transportation by a single performer. The Model 50 Series was available as either Model 52, with a 3 1/2-octave range of F (below middle C) to C, or as Model 54, with a 4-octave range of C (one octave below middle C) to C. Model 54 had bars 2 1/4 by 15/16 inches to 1 5/8 by 3/4 inches in size, which vary in length from 17 3/4 to 7 1/4 inches. 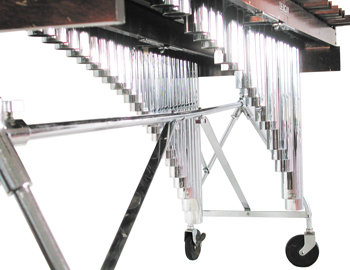 Weighing 123 lbs., the instrument stands 35 inches tall and is 68 inches in length. 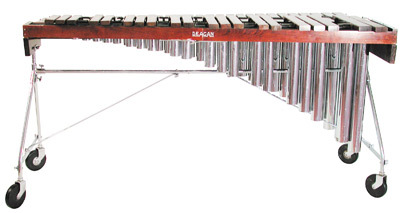 The original cost in Deagan’s Catalog No.101 (c. 1937) was $280.